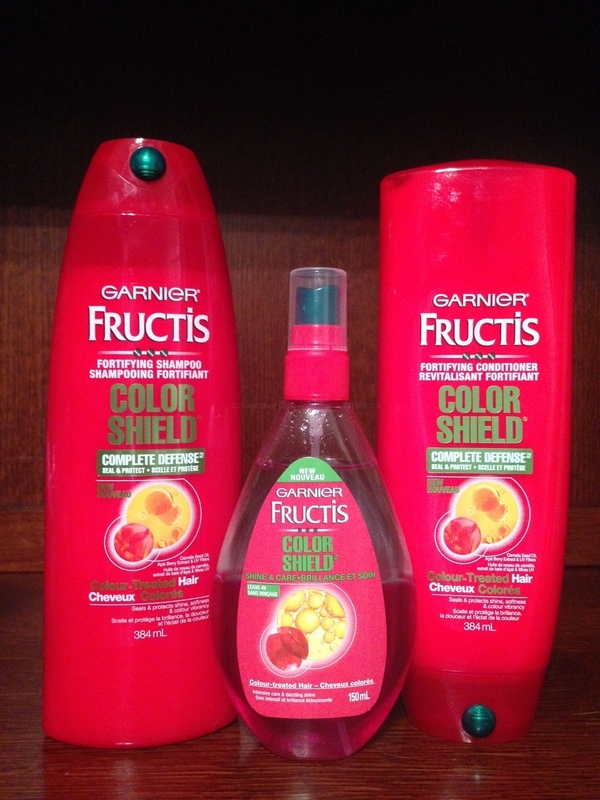 As you know I am a member of Influenster and was asked to review the Garnier Colour Shield box. I haven't dyed my hair in a few years so I asked Jenn to review the products. I gave the shampoo and conditioner a try at first and found the smell AMAZING! It also did add some shine into my hair! I'll let Jenn take the post from here. It was such a pleasure trying out this trio! The smell is what initially intrigued me, it has a nice fruity berry scent. This shampoo makes a thick luxurious lather, and a little goes a long way. Upon applying the conditioner I was skeptical on it coating my hair well enough to to de-tangle and coat my hair, because it is a thinner cream than what I am used to. I was surprised that once I rinsed out the conditioner my hair felt very smooth. After rinsing I wrapped my hair in a towel like I normally do and did the rest of my daily routine. When I was ready to style my hair I shook up the colour shield spray to mix the product together (because it separates) then did a few spritz and combed through. My hair typically is hard to comb through and I found it did not assist in making the brushing any easier, the smell of the spray is nice and fruity but smells different than the shampoo and conditioner. I styled my hair as usual with a round brush and blow drier, my hair felt extra smooth and soft! Once I was done I smoothed the fly a ways with a few spritz of the spray, and then smoothed everything by running my fingers through my hair. I do see myself repurchasing this in the future, my hair smells great, feels smooth and has an added shine. There you have it! Thanks for reading folks!